Ok, so in the current blogging series we are offering tips for those who are new at marketing and are launching a new website. Last week in Launching A New Website, we gave you ten FREE SEO TIPS in making sure your website was at least SEO friendly and in compliance with today’s webmaster guidelines. 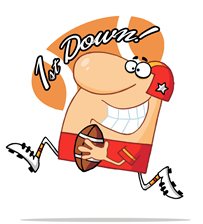 In this post I want to offer another TEN SEO TIPS as you launch your new website, that should score you a FIRST DOWN! First Yard: Join your local Chamber Of Commerce. “Even if your chamber is not real active, you should be able to get a good inbound to your website from a reputable local website like the Chamber or at least a link that people know. Second Yard: Join your Local BBB. You may have “ personal feelings about the local BBB” but DON’T” fight the good stuff. The website BBB.org is an authority, and passes good link juice that is picked up by many other directories. Third Yard: Grand Opening Press Release. This Hits Hard…. If you are not selling your business nobody is. PR WEB is a great resource for a GRAND OPENING Press release. Be sure to list your physical location in the footer of the press along with the local phone number. Fourth Yard: Hold a contest and pass the news of the contest “GIVING AWAY” a service you offer, spreading the word through Twitter and Facebook to all your local friends and followers. Fifth Yard: Street signage when possible.. If you have an actual brick and stick office, be sure to post a “GRAND OPENING” sign and invite all the other local businesses to your Grand Opening Party… Include a GIVE AWAY or Contest to all that show. Your local Chamber will likely help you with this, inviting all other Chamber Members. Little extra “NUGGET” HAVE A SIGN IN SHEET collect name and email addresses for later use..
Sixth Yard: Another Press Release showing the turn out of your Grand Opening, listing the winners and their business information. Share this Press with Twitter and Facebook friends and followers. Seventh Yard: Be sure to build a detailed list of all local businesses, follow and friend them on your social networks. Ninth Yard: Offer something for nothing in your Blog :) Just like these Tips…. Free is good and people want to share, so, LINK TO THIS POST.. Go ahead… It wont hurt a bit…..
Tenth Yard: Stay away from LINK BUILDING SOFTWARE…… There is NEVER a reason for a NEW website to take a chance in getting punished by the first down Gods of Google! Ethical SEO SERVICES always include ethical link building. Extra Nugget!! People like exciting!!! be proud of your new venture and GET EXCITED….